When Lysander and Hermia stop to spend the night in the woods, Hermia in one motion sets out a pop-up tent to sleep in (I'm not sure Oberon has that much magic in his hand). Let's start with the dinosaurs. This was our second production of William Shakespeare's A Midsummer Night's Dream in one day. Our matinee show was A Midsummer Night's Dream: A Chamber Play, a scaled-down, four-actor adaptation by director Peter Sellars that turns Shakespeare's script into a waking nightmare of abusive behavior and entrenched victimization. It's serious, it's troubling, it's adult fare but only for adults who are mature enough to handle its sizzling social themes and brutal intensity. 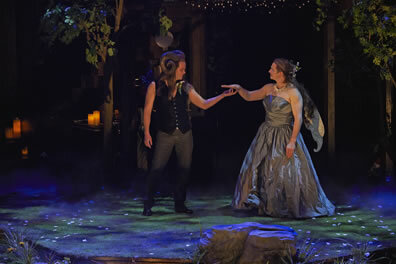 Oberon (Evan Buliung) meets with Titania (Jonathan Goad) in the Stratford Festival's production of William Shakespeare's A Midsummer Night's Dream, set as part of a wedding in the Festival Theatre. Buliung and Goad alternate their roles during the play's run. Photo by Michael Cooper, Stratford Festival. While there's an important place for such navel-gazing theater, I found myself most enlightened on this day of Dreams while waiting outside the washroom before entering the Festival Theater for the Chris Abraham–helmed production of A Midsummer Night's Dream. There, across the hall from me, stood a little boy—8 years old, at most?—with his dad. In the boy's hands were two plastic dinosaurs. So many pleasant thoughts crossed my mind at that moment: how cool that the family (mother and older daughter soon showed up) was attending the theater together and how smart for the parents to let the boy bring something to amuse himself instead of forcing him to watch Shakespeare. And, I wondered, how likely it was that the boy would end up entranced by the play, anyway. Once I saw this production, I was sure the poor stegosaurus and T-Rex had lain in idle neglect for most if not all of the evening. While Sellars goes over-the-top dramatic with his chamber version of A Midsummer Night's Dream, Abraham goes over-the-top comic in his main-stage production. That's because we really aren't watching Shakespeare's play: we are watching guests at a wedding reception put on Shakespeare's play for the newlywed couple. This framework had its thematic purposes, and perhaps a historical anchor, too (it's possible Shakespeare's original theater company staged A Midsummer Night's Dream at a noble's wedding). But its main purpose is to keep the proceedings as good-timing light as possible. Extra-textual asides are OK: Theseus is played by the reception host who is played by Scott Wentworth who reminds everybody after one fit of loud jollity, "remember, I have neighbors." Lots and lots of little kids being cute on stage is something to "awwww" over and not "grrrrr" at, even when they sing the hit song "Grenade" in boy-band style (I'm down with Bruno Mars, but I do not like that song). And when Oberon fell into a pond on stage, we could not be sure whether it was a true accident or not: Evan Buliung, playing the fairy king on this night, had already endured an ALS bucket challenge in that pond during the intermission, so his irritated reaction to slipping back into the water in his first scene in the second half seemed genuine. Finally, because this is a play within a play (with a play within the play within the play), the actors don't have to go deep into their characters. Abraham's production is an antidote to the Chamber version; that one goes deeper into these characters than most people would desire to go. Most of all, Abraham and company emphasize that this night is all about having fun with Shakespeare's funniest concoction. Designer Julie Fox's grass-covered stage is set up for the wedding reception (the setting is this day, 2014) with white bows adorning the aisles in the auditorium. Guests are already arriving, including one man taking pictures (and notably photographing people in the audience photographing the stage). Actors mingle with the audience settling in for the play. Maev Beaty moves up our aisle offering tissue for wedding criers. She will end up playing Hippolyta when she's not operating one of the floor spotlights on the stage (all of the company take turns doing spotlight duty). In the play itself, when Lysander and Hermia stop to spend the night in the woods, Hermia in one motion sets out a pop-up tent to sleep in (I'm not sure Oberon has that much magic in his hand). Thus does Puck (Chick Reid) find Hermia on the "not so dank and dirty ground." Snug the joiner (Karl Ang) wears orthodontic headgear and facebow (for Pyramus and Thisbe, he pins his lion's fangs to the brace, though they get displaced in the action by Ninus's Tomb). As Bottom (Stephen Ouimette) words out the composition of Snug's prologue, the weaver keeps trying lines until Snug can say one without a lisp, turning what's already in the script to a new comic purpose. There are also funny lines that are not in Shakespeare's script. Quince's suggestion that someone could play Moonshine in Pyramus and Thisbe is initially met with derision from the other mechanicals, one even saying "Why would you even say that?" And after Helena (Liisa Rep-Martell) accuses the other three lovers of conspiring to make fun of her, both Demetrius and Lysander insist, in turn, "no," but Hermia replies with a flabbergasted "Huh?" as fitting a response as any to Helena's flight of fancy. Yet, Abraham takes to heart Shakespeare's roundabout way of championing true love in A Midsummer Night's Dream. If there's a foundational verse for this production, it's Hermia (Bethany Jillard) exhorting Theseus that "I would my father look'd but with my eyes," as she loves Lysander, not as he thinks she should love Demetrius. True love comes from deep inside and is not something that can be implanted. This theme actually starts with Theseus and Hippolyta, he who won her in battle doing her injury but all too soon becomes smitten with her, and she seems so with him, too (if you read the play's ending fully). Lysander sways from Hermia only under the influence of the love potion, which also is responsible for Titania swooning over Bottom. The cynic will point out (as I have before) that Demetrius's true love is actually a drugged state, but the counter argument is that his sudden lust for Hermia had displaced his previous—and true—love for Helena; that does happen, you know (and he says as much when he describes to Theseus his turnabout from Hermia to Helena). Finally, only when Titania and Oberon reunite does the earth become whole again. This production's using "look but with my eyes" as its hook starts with the framework wedding. It is a gay couple who have just been married (after they enter the reception to shouts of "surprise!" from the guests, they are led to chairs at the foot of the auditorium to watch the play). In the play proper, Lysander is a woman, played by Tara Rosling. For the roles of Oberon and Titania, Buliung and Jonathan Goad switch from performance to performance. And in one further piece of inclusive casting, the part of Egeus, Hermia's father, is played by Deaf actor Michael Spencer-Davis. Note the interactions on stage when it comes to his lines; Lysander looks at the interpreter, not Egeus, a sign of disrespect toward the Deaf speaker (as Lysander speaks to Theseus, Hermia becomes her father's translator). Casting a man in the role of Titania is nothing new, of course; Shakespeare's company did that by law, and we've seen such casting ourselves. Turning these two roles into alternating parts, a la Richard II and Bolingbroke or Othello and Iago, is new to me, but it insinuates that Titania is equal in power to Oberon. Goad doesn't ham up his cross-dressing part, and once the audience gets over the initial laughter of seeing a man in a beautiful, strapless ballgown with wings, his Titania becomes, merely but powerfully, Queen of the Fairies (and Goad puts on some wonderful diva moves). Buliung, looking hot in just a black vest and jeans and black ram horns circling off his forehead, balances his power with a gentleness in his demeanor, and his verse speaking likewise brings poetic quality to the testosteronic nature of his lines. I'm sure each of these actors would make a great counterpart character. 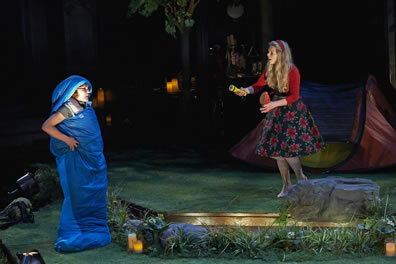 Lysander (Tara Rosling), infected with Puck's love potion, wakes up doting on Helena (Liisa Repo-Martell) whom Demetrius has left behind in the woods in the Stratford Festival production of A Midsummer Night's Dream. Hermia is still sleeping in the tent in the background. Photo by Michael Cooper, Stratford Theater. Certainly, Lysander being a woman is a plot gimmick for modern times, but it works and, well, why not do it? We can argue to doomsday on whether Shakespeare might have written it that way today (I take no side in the argument except to say that Shakespeare died in 1616), but the point is, as written, the device works within the text—for the most part. It not only adds a palatable tension to Egeus's resistance to his daughter's attraction to Lysander, it adds a rich dynamic to the lovers' quarrel as Lysander suddenly starts lusting for Helena. Even the textual anomalies caused by this gender-switch play into the comedy. There's wry humor in Lysander saying that her aunt "respects me as her only son." Oberon instructs Puck to apply the love potion to a man wearing Athenian clothes, and Puck stumbles upon Lysander in a sleeping bag zipped up to her neck: OK, she looks manly enough (that's a powerful potion, by the way; it's supposed to be applied to the eyes, but Lysander is sleeping with her glasses on). Answering Oberon's accusation that Puck might have "committ'st thy knaveries wilfully," Puck says, "Believe me, king of shadows, I mistook. Did not you tell me I should know the man by the Athenian garment he had on?" Oberon looks incredulously at his henchspirit for a beat before stating the obvious: "A man!" Reid's Puck shrugs as if to admit that, well yeah, there is that. Then as Puck removes the spell from Lysander, Reid says, "Jack shall have Jill" and, with a wink, she adds, "Jill shall have Jill." The fact that Hermia, by all evidence, is a lesbian also adds a comic dimension to Demetrius's pursuit of her. But Shara needs no further comic subtext than the talents he brings to the role. Looking like Vinnie Barbarino with the five-cent mind of Nuke LaLoosh, Shara is funny to watch whether he's speaking a line, reacting to a line, or off to the side listening to lines with a persistent state of confusion settled upon his demeanor. He knows he's the best-looking guy in the room and, well, that's enough to cure any woman's homosexual tendencies, isn't it? Shara is a skilled verse-speaker (he plays Cornwall in the Festival's production of King Lear, as opposite a role to his Demetrius as you can imagine), but he appropriately embellishes Shakespeare's texts at key moments. His assertion to Lysander that "You are too officious in [Helena's] behalf," Shara delivers as "You are, like, waaaaay too officious in her behalf." When at Puck's prompting a pack of child fairies forcees Demetrius to sleep, Shara shouts, "But I have more lines!" We could wish him the chance to speak those lines, as I'm sure they would be hilarious, too. But, in fact, Shara is so wedding-guest-like in his Demetrius that the humor derives as much from the circumstances of the setting as the circumstances of the play itself. That, ultimately, is the success of this production: It is a perfect marriage.